A male patient experienced a spectrum of complications, including loss of best corrected vision, fluctuating vision, halos, glare, starbursts, loss of contrast sensitivity, and photophobia after multiple refractive and corrective surgical procedures. Patient uses artificial tears frequently and Pred Forte once per week. Patient wears bifocals for refractive correction. The image to the left is a current photograph of the patient's cornea taken by Dr. Edward Boshnick. 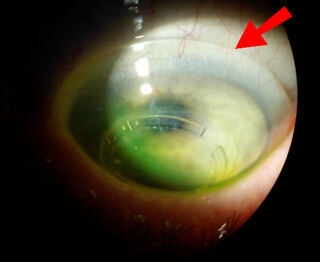 The unusual ring around the periphery of the cornea is INTACS, which were implanted by a surgeon in Tennessee in an unsuccessful attempt to improve patient's vision. Patient went in for LASIK consultation 10 years ago and was told that he was a perfect candidate, despite clinical evidence of advanced keratoconus. Patient had bilateral LASIK. After initial LASIK surgery, patient’s right eye was retreated five times with PRK, and again with LASIK. Surgeries were unsuccessful. Patient's right eye developed ectasia. Patient went to a surgeon in Texas who performed a corneal transplant on his right eye. Following the transplant surgery, the surgeon performed LASIK surgery and a LASIK retreatment on patient's transplanted right cornea. Surgeries failed to restore functional vision. Five years later the patient's left eye developed ectasia. A corneal transplant was performed by a surgeon in Tennessee. The transplant was unsuccessful in restoring patient's vision. Two years ago another surgeon in Tennessee assured the patient that his vision could be corrected with INTACS. The patient consented and was implanted with INTACS in both eyes. Like previous surgeries, this surgery did not restore functional vision. Subsequently, the patient developed cataracts, likely as a result of multiple surgeries and extensive use of topical steroids. The patient had cataract surgery six months ago. Patient’s quality of life has been severely diminished. Patient’s eyes fatigue easily when engaged in visual tasks such as reading or using a computer. Patient was previously an avid tennis player but can no longer play tennis. Patient has been unable to drive, day or night, for three years. Patient lost his six-figure income, his hobbies and friends. Patient's relationship with his family suffered as a result of his injuries. Patient became disabled, fell into depression, and had suicidal thoughts. Patient became addicted to pain medication prescribed by his doctor. The addiction almost cost the patient his life. It all started with LASIK... A harmful, unnecessary surgery that is promoted like it's as safe as a haircut. Eyes are too precious to risk on an elective surgery. People take their vision for granted until they lose it. The patient consented to having his story told to warn others. 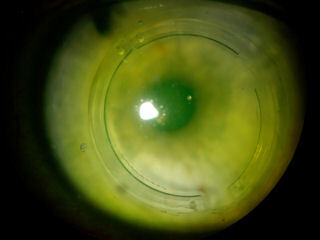 This photograph shows the patient's eye with a specialty scleral lens. A very large diameter lens is required to vault over the entire irregular cornea. The patient hopes that he can tolerate the lens and recover his vision.